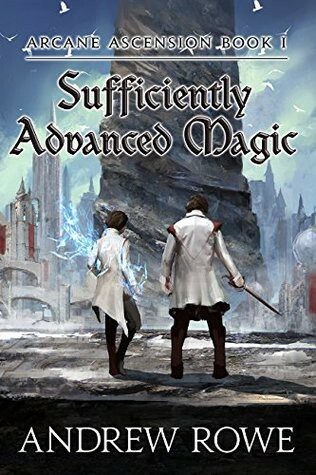 ‘Sufficiently Advanced Magic’ is the first book in the ‘Arcane Ascension’ series. Andrew Rowe is its author. He is a professional game designer who’s worked at Blizzard, Obsidian and Cryptic Studios. His expertise shines through in his books where the worlds are meticulously designed, with magic being almost counter-intuitively scientific. Let’s talk about Sufficiently Advanced Magic. It is one of the best High Fantasy books I have read this year. For folks who like analogies, this is like an adult Harry Potter meets Dungeons and Dragons. The premise is simple. There is a tower (actually a set) where a selected few go to gain abilities or to improve on existing ones. Some of them come out and others disappear. This is the D&D aspect. The majority of this book is set in a school who’s aim is to prepare ascended students to gain more levels and this is the Harry Potter equivalent. This book is written in the first person, from the point of view of Corin Cadence. He is driven to find out the fate of his more accomplished brother, who did not come out of his trials. I found Corin Cadence’s character to be quite compelling and rational in his behavior. Other characters are also equally well written, though the one’s closest to Corin get more book time. The writing is excellent throughout. Andrew Rowe keeps us interested throughout with a great mix of action and wit. The book is fast paced and the plot gets murkier (though not overly complicated for veterans of fantasy). There are a number of factions which are obviously at cross purposes with each other. I found the ending to be completely out of the blue and I am super satisfied with it. The meat of the book is in its world building. Veterans of RPGs will find the tower designs and skill trees to be familiar and, at the same time, unique. These are well structured and make sense, given their initial assumptions. At many points in the book, I found myself thinking that I would love to play a game based on the book. This is both it’s strength and weakness. True geeks will love this while casual dabblers might not find this complexity to their liking. In conclusion, I had a blast reading this book.I recommend it to all readers of fantasy, both veterans and newbies.